. 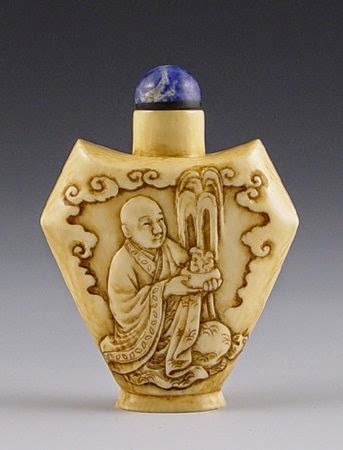 zooge 象牙 ivory art in Japan . are miniature sculptures that were invented in 17th-century Japan to serve a practical function (the two Japanese characters ne+tsuke mean "root" and "to attach"). Many netsuke with Daruma introduced here are from extensive internet search of Ebay, Trocadero and other soucres. Since they usually disappear soon from the web, I have prepared a safecopy in my photoalbum. 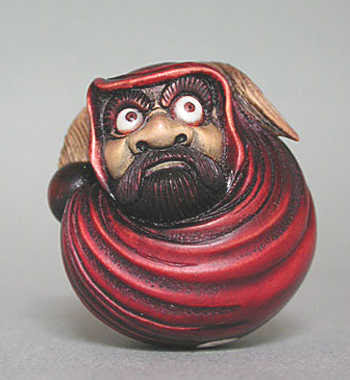 I wish to express my thanks to the many dealers who show their Daruma netsuke online. 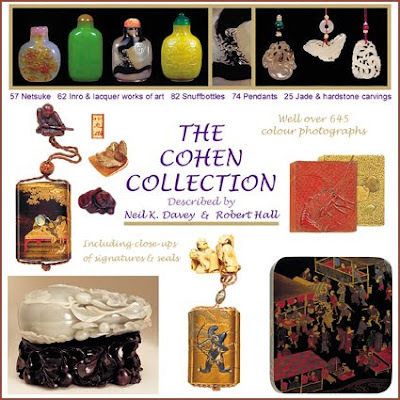 If this little collection would help to promote the sales, I will be happy ! And if you want to share them here directly too, please go ahead. 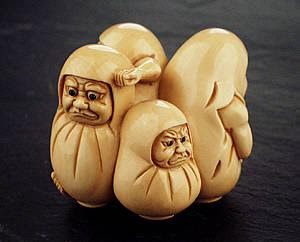 The order the netsuke are listed below is arbitrary. Click on the links to see the pictures please. 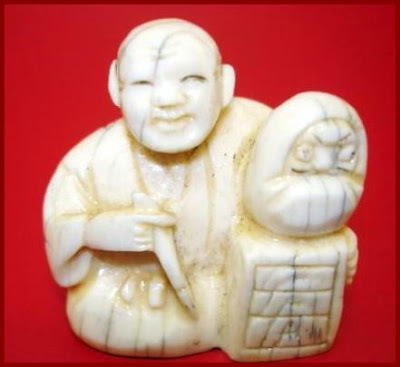 19 century ivory netsuke of a boy making a snowman in a form of theZen Buddhism patriarch Daruma, with his handprints all over thesnowman. 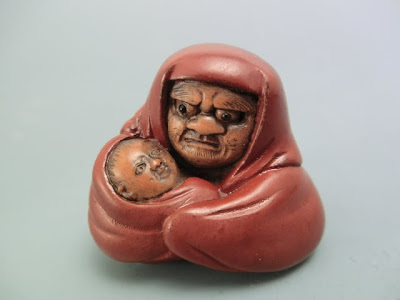 Excellent carving, especially facial expressions - delightedof the boy, and ferocious of Daruma, very nice patina. 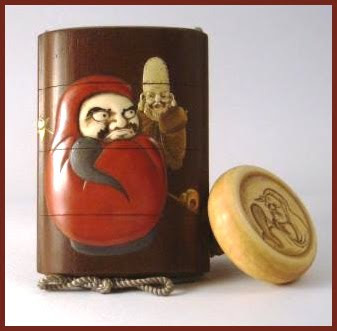 The hair knots of the boy and the eyes of Daruma are inlaid with dark horn. Nice etched pattern on textiles, usual age lines. 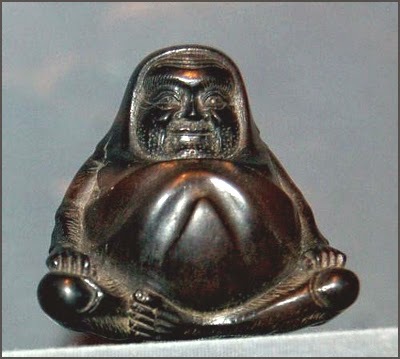 Wonderful sculpture -all that a good netsuke should be. Signed MASAHIRO on the bottom. Masahiro Gyokkosai of Osaka school worked in mid-19th century, was one of the foremost students of Mitsuhiro and carved much in the style of his master - see NETSUKE & INRO ARTISTS AND HOW TO READTHEIR SIGNATURES by George Lazarnick, p.704. Length 1 3/4 inches.1250 Dollars. 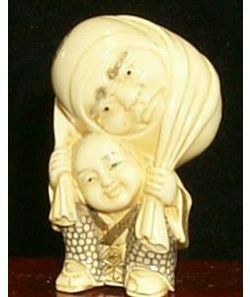 Late 19th century ivory netsuke carved as Daruma (Boddhidharma - thefounder of Zen Buddhism) wearing an earring and enveloped in hismonastic robe with cape, sitting trying to read a book, while beingdistracted by oni (little mischievous demon) standing by his side with a club in its hand. Fantastic carving of the face with the expression of extreme annoyance, great rendition of hair in his beard and on his chest. Very nice patina, old age lines in ivory, old restoration (about a third of the front page of the book, very welldone). Signed GYOKUUNSAI on the bottom - the artist is listed on p.432 of NETSUKE & INRO ARTISTS AND HOW TO READ THEIR SIGNATURES byGeorge Lazarnick. 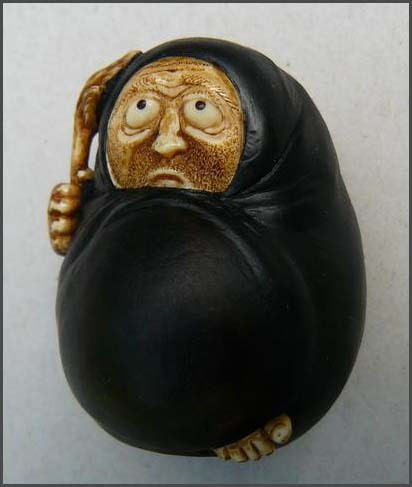 19th century ivory netsuke in manju (rice cake) shape carved insunken relief with Daruma (Boddhidharma - the founder of ZenBuddhism) wearing earrings and enveloped in his monastic robe blownby the wind. The back is decorated with incised hossu - flywisk.Fantastic carving of his face with the expression of extremeconcentration, great rendition of hair in his beard and on his chest.Himotoshi in the center of the back is lined with ivory inset stained green. Two parts fit nicely, honey colored patina on the back where netsuke was touching the silk of kimono. Signed GYOKKEI on the back.For information on the artist see NETSUKE & INRO ARTISTS AND HOW TOREAD THEIR SIGNATURES by George Lazarnick, p. 417. Wonderful work ofart by the master carver. 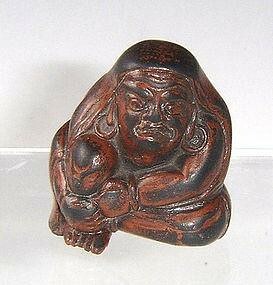 Wooden okimono size netsuke 19th cent. okimono representing standing Daruma (founder of Zen Buddhism) enveloped in his monastic robe. Wonderful face with almost portrait features, graceful flow to his robe. Himotoshi might have been added, old smoothed and stained loss at the bottom of the robe on the back . 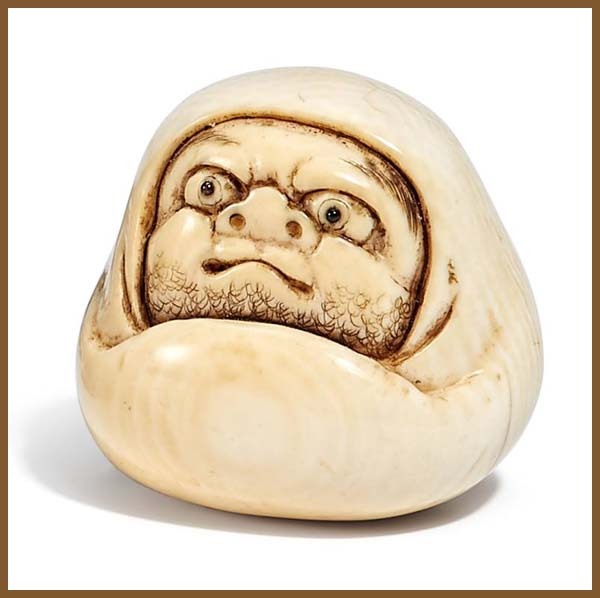 19th century ivory netsuke carved as a cloth toy in a form of Zen Patriarch Daruma stretching and yawning after 9 years of meditation. Excellent carving, fantastic facial expression, great rendition of the patched body of the doll with various textile patterns. Beautiful staining and patina from wear, old age line. 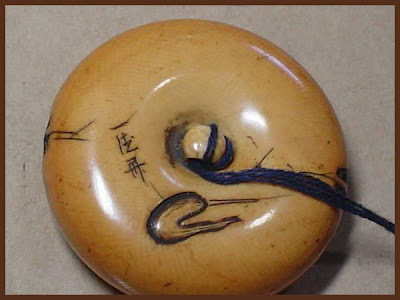 Signed GYOKUSAI in an oval reserve on the side - the carver is probably one of the 3 artists who signed this way (see Neil Davey NETSUKE, p. 461). Numerous Daruma. 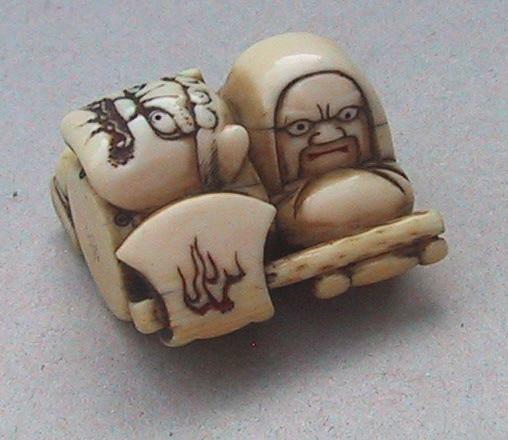 Ivory19th century ivory ojime (slide bead for tightening the cord goingfrom netsuke to inro) carved in the round with numerous dolls representing Daruma (the founder of Zen Buddhism). Excellent clevercarving, central hole is lined with silver, wonderful warm patina andbeautiful sheen to the surface, in very good condition. Height 13/16inches. 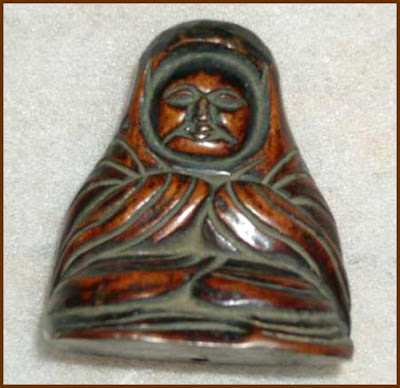 Late Meiji period (1890s -1912) wooden okimono of cloth doll of Daruma (founder of Zen Buddhism) enveloped in his monastic robe. Skillfully carved out of chosen matsu (Korean pine wood) in ittobori (one cut) style characteristic of Hida school of netsuke carvers with clever use of wood grain as element of design. the Indian priest who so worshipped the Buddha that he cutoff his eyelids to prevent them from closing while he prayedendlessly, so long indeed that his legs shriveled beneath him. 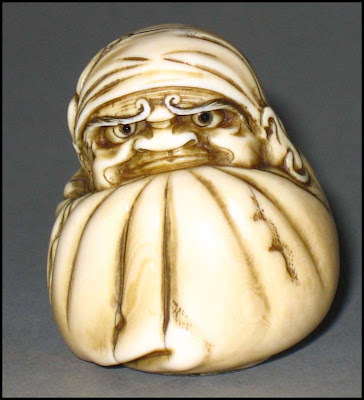 Thisexquisite little ivory netsuke portrays him as a rolypoly figurewhose eyes pop out when the figure is moved. Japanese, early Twentieth Century, and signed by the artist, it is approximately 1-1/4 inches high by 7/8 of an inch in diameter. 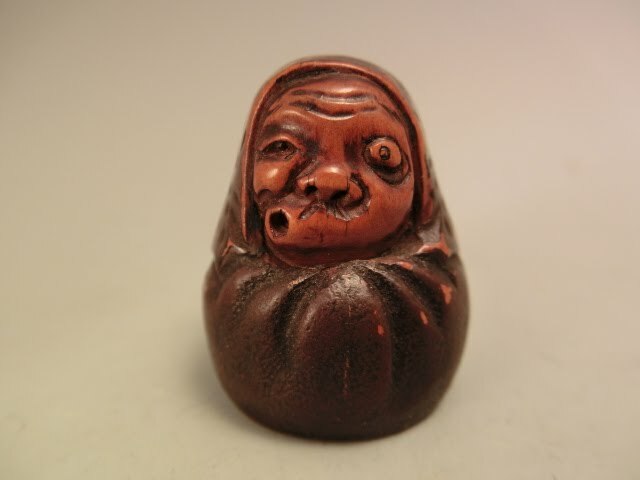 A Bizen stoneware netsuke showing Daruma enduring moxa. Height: 1 ½in. 19th century.The identical figure in the renowned Raymond and Frances Bushell sale(Part 1, 27 October 1987, lot 274) realised £ 550. Bushell’s example is illustrated in Arts of Asia 3/4 1976, fig. 12. A good quality boxwood and marine ivory okimono of a child with an outsized Daruma doll. Height: 1 5/8 in. Unsigned. Meiji. Late nineteenth century. 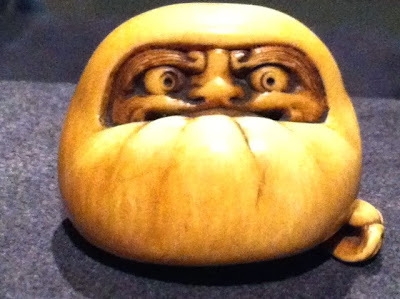 Late 19th Century Of Daruma seated in a meditating position and wrapped in his coat.The pupils are inlaid in dark horn and the details very well carved.The wood used is probably a fruit wood, possibly from the cherry or persimmon tree. Carved seated and holding a wisk. Date: Meiji period, 19th century. Size: 1 1/2 in. high. A very nice manju of octogonal form representing Onna Daruma, the ivory bearing a good patina, signed in cursiv at the back of the piece. Boy playing with Daruma Doll. Polychrome. Komin. 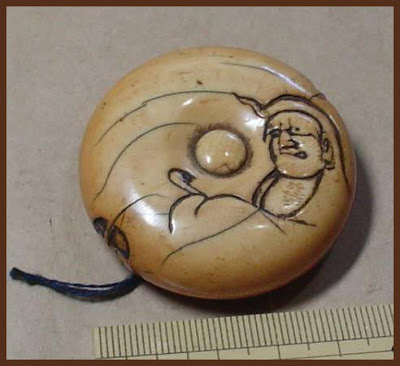 A polychrome ivory netsuke of a young boy kneeling down to play with a tiny Daruma doll. Carved and signed by Japanese artist Komin, 20th century. 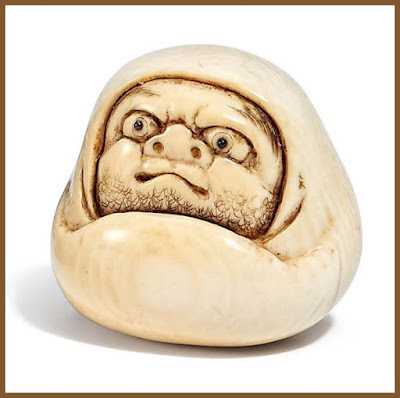 When Westerners began to take an interest in netsuke, particularly in the late 19th and early 20th centuries, netsuke carvers turned to the world around them for netsuke subjects. Activities of ordinary people, such as this child at play, helped create a picture of Japan during the period in which the pieces were carved. Daruma, the monk who brought Zen Buddhism to Japan, has become a familiar and beloved figure with an important place in religion, art and folk culture. His most frequent representation is of a roly-poly figure without limbs. This roly-poly figure makes one of the most popular toys in Japan. A symbol of patience and perseverance, it rights itself when knocked over. Condition is excellent with wonderful patina. Overall dimensions: 1 ½” x 7/8” x 1” high. L. 3,2 cm1. Häfte 19. Jh. Schneeball-Daruma Elfenbein, H. 2,7 cmSign. : Masahiro Ôsaka, 19. Jh. Looks very unauspicious, until you turn him upside down. Diameter about 45 mm. It has two small holes in the tsumami. 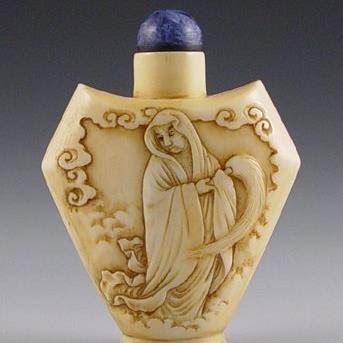 It was most probably made from ivory in the Edo period. They are not all in my position, this is a virtual collection. More thumbnail netsuke photos ! Click on the thumbnail to view more ! about 3.9 cm high and 30 g heavy.
. inroo, inrō 印籠 / 印篭 / いんろう Inro, pillbox, pill box . An inrō (印籠) is a traditional Japanese case for holding small objects, suspended from the obi.
. Cats and Daruma 招き猫とだるま Manekineko .
. Netsuke omamori 根付お守り netsuke amulets . the base with a shou character. among the court, rich landlords and merchants. digestion. Beijing was always the center of snuff usage in China. were that they were small enough to fit in the palm of the hand. really made during the reign of Tao Kuang (1821-1850) or later. Shantung although the cutting itself was done in Beijing.
. . . CLICK here for more Photos of Handaka Sonja!
. Daruma dancing with both legs 足　ashi . And now Daruma is sneaking out on tip-toe . .
wow, thanks for the very thorough and comprehensive list. an all-around excellent resource! if i could just recommend a great online resource for antique/modern netsuke auctions?-- antiquespider. 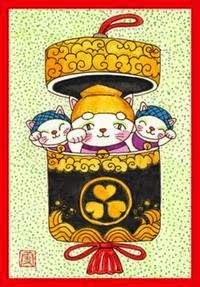 good luck and happy netsuke shopping! 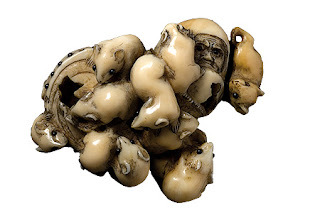 The British Museum’s Noriko Tsuchiya compiles an intricate selection of netsuke, a prized Edo Period (1603-1867) art form of miniature sculptures. Her book contains 100 photographs, paired with color illustrations to contrast composition and artistic expression. First half of 19th century. NETSUKE. LARGE RAT, ITS LONG TAIL WRAPPED AROUND THE BODY. Take your time to browse ! Miniature meditating skeletons, snarling cats, eerie ghosts, and gods of fortune carved in ivory, wood, and horn adorned the sashes of Japanese men throughout the Edo period. From the 17th to 19th century, these netsuke carvings evolved as an increasingly elaborate art, eventually collected around the world. The British Museum in London has over 2,300 examples in its collection, 100 of which were newly photographed for Netsuke: 100 Miniature Masterpieces from Japan by Japanese art curator Noriko Tsuchiya, published by Overlook Press.